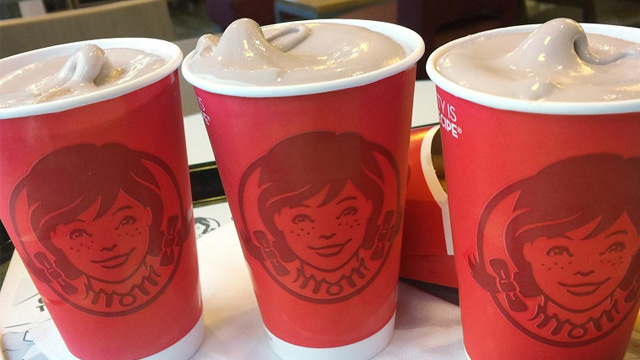 Get ready to dig in! 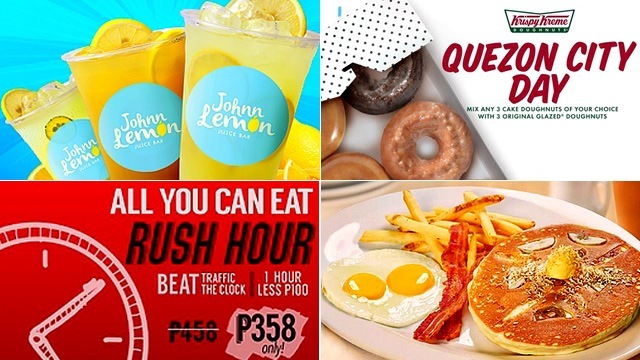 (SPOT.ph) We're kicking off the long weekend with a bunch of awesome steals and deals! Go on a food trip and indulge yourself with doughnuts, gelato, pizza, and more. We also found promos on your favorite drinks! How does unlimited wine sound? Here's one for you and another to share! 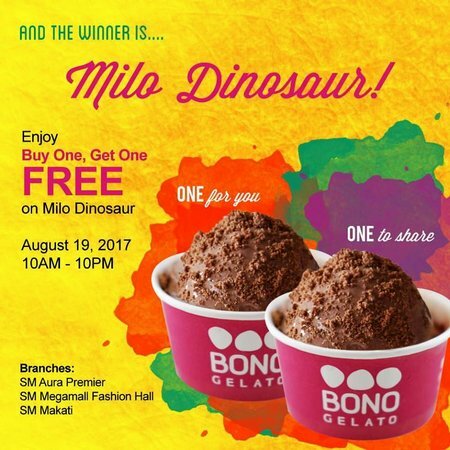 Just for today, BONO Gelato is having a buy-one-get-one promo on its Milo Dinosaur flavor. Don't miss this sweet treat! See a list of BONO Gelato branches. For more information, log on to BONO Gelato's Facebook page. 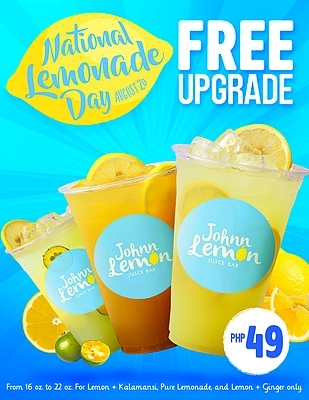 Save the date for National Lemonade Day at Johnn Lemon (get it? ), happening tomorrow, August 20. Enjoy a free upgrade from 16 ounces to 22 ounces for your choice of flavor: Pure Lemonade, Lemon + Kalamansi, or Lemon + Ginger. See a list of Johnn Lemon branches. For more information, log on to Johnn Lemon’s Facebook page. 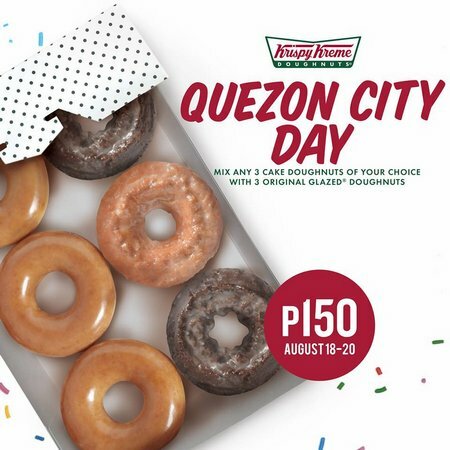 Krispy Kreme is bringing the party to the north of the Metro this weekend. Grab any three Cake Doughnuts and mix it with three Original Glazed Doughnuts for only P150. Available until tomorrow, August 20 only at selected Quezon City branches. See a list of participating Krispy Kreme branches. For more information, log on to Krispy Kreme's Facebook page. 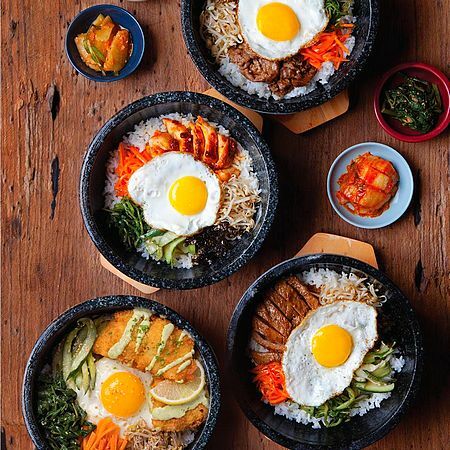 Enjoy Sariwon’s Sizzling Lunch Baps! Choose from Beef, Pork, Spicy Chicken, and the new Crispy Fish. Each dish is served with beef bone soup, a glass of citrus iced tea, and four refillable side dishes—all for just P275. They’re available from Monday to Friday, 11 a.m. to 4 p.m.
Sariwon is at Bonifacio High Street Central, 7th Avenue, Bonifacio Global City; and G/F Promenade, Greenhills Shopping Centre, Greenhills, San Juan City. For more information, log on to Sariwon’s Facebook page. There are plenty of drinks for everyone at Titto's and the best thing is that they’re available all day every day. 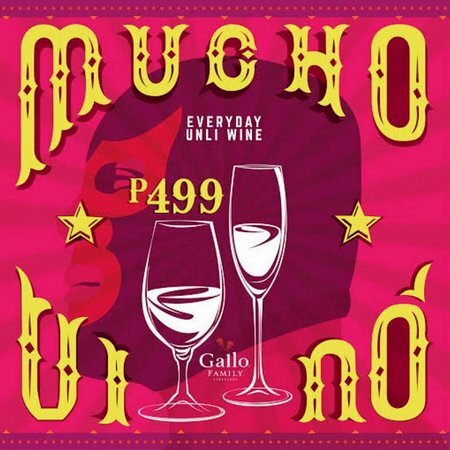 Have your fill of unlimited wine for P499 and unlimited margarita for P399. Titto’s is at 16 East Capitol Drive, Kapitolyo, Pasig City. For more information, log on to Titto’s Facebook page. Are you up for some pizza madness? 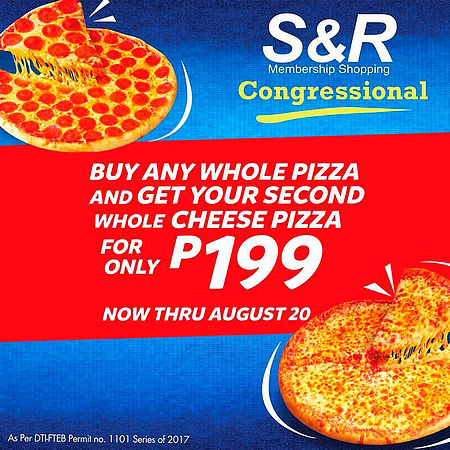 Drop by S&R Congressional to get your second whole cheese pizza for only P199 when you buy any whole pizza. S&R is at 30 Congressional Avenue, Ramon Magsaysay, Bago Bantay, Quezon City. For more information, log on to S&R’s Facebook page. 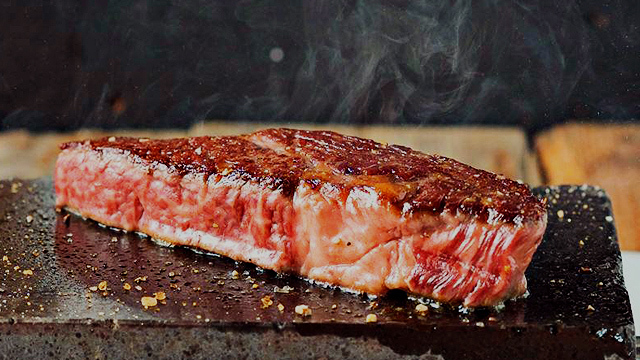 Get a taste of Draft’s delectable lunch specials, available every day from 11 a.m. to 3 p.m. Lunch meals start at P185 and are served with Draft Gastropub homemade iced tea. 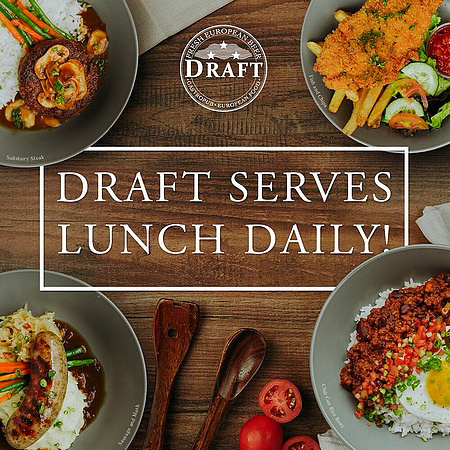 Draft is at G/F­ Ayala Malls The 30th, Meralco Avenue, Pasig City; Greenbelt 2, Makati City; and Molito Commercial Complex, Alabang, Muntinlupa City. For more information, log on to Draft’s Facebook page. From 5 p.m. to 6 p.m. or 6 p.m. to 7 p.m., you can avail RBCTY's All You Can Eat Surf and Turf promo for only P358, instead of P458. 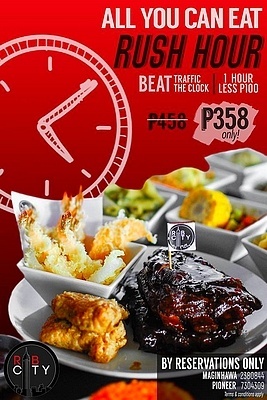 Enjoy unlimited RBCTY ribs, chicken wings, tempura, side eats, and more instead of sitting in traffic. RBCTY is at 63 Maginhawa Street, UP Village, Quezon City; and UG/F Pioneer Highlands North, Pioneer corner Madison Streets, Mandaluyong City. For more information, log on to RBCTY’s Facebook page. 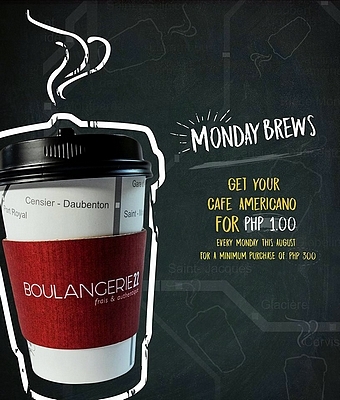 You can get a cup of brewed Americano from Boulangerie22 for only P1 for a minimum purchase of P300. This promo is available every Monday this August on selected Boulangerie22 branches only. See a list of Boulangerie22 branches. For more information, log on to Boulangerie22’s Facebook page. 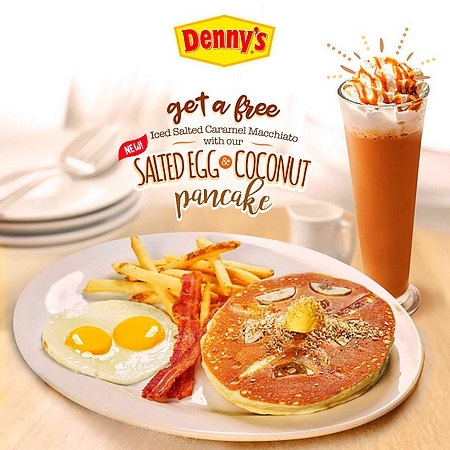 Enjoy a free Iced Salted Caramel Macchiato with the new Salted Egg & Coconut Pancake from Denny’s. All you have to do is like and share this post from the Denny’s Facebook page and show it to the counter upon ordering. This offer is available until August 27 only. See a list of Denny’s branches. For more information, log on to Denny’s Facebook page.